Can Rick Barnes and Texas topple Kansas dominance? Normally, one team enjoying a decade of dominance in a particular conference would be cause for concern. Kansas has won at least a share of 10 consecutive Big 12 titles, but the league is anything but dull even if the Jayhawks manage to win the conference title every season. The 10-team league produced seven NCAA Tournament teams last season, and every team in the league besides TCU was a threat on a nightly basis. Asking the Big 12 to replicate that kind of balance and consistent entertainment will be tough, but this league will try. At the top, Kansas reloads as usual with freshmen Cliff Alexander and Kelly Oubre stepping in for Andrew Wiggins and Joel Embiid. The Jayhawks should have a bona fide challenger in Texas, which adds five-star freshman Myles Turner to a core that saved Rick Barnes’ job a year ago. Iowa State brings in a handful of impact transfers as again, and Oklahoma and Kansas State figure to be factors under veteran coaches Lon Kruger and Bruce Weber. The league’s depth from last season will be tested, though, as Baylor and Oklahoma State figure to take steps back after losing key personnel. 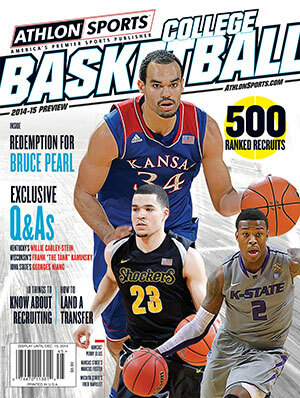 Previews of every Big 12 team and more are available in the 2014-15 Athlon Sports College Basketball Preview. Even without Andrew Wiggins and Joel Embiid, the Jayhawks are Big 12 favorites … again. It’s Perry Ellis’ time to shine. Only a year removed from the hot seat, Rick Barnes has a contender in Austin. Isaiah Taylor is a star. The Cyclones lost two of the Big 12’s top five players in DeAndre Kane and Melvin Ejim but welcome back Georges Niang. Buddy Hield emerged as a star during his sophomore season and should be even better this year. When Marcus Foster is on, the Wildcats are good enough to beat anyone in the league. Redshirt freshman Johnathan Motley has to come up big for the Bears down low. Le’Bryan Nash and Phil Forte are studs, but will that be enough to make the NCAA Tournament? A rash of offseason defections will hurt the Mountaineers, but Bob Huggins did a nice job reloading. The Horned Frogs were winless in the Big 12 last season; they won’t be in 2014-15. Getting players to Lubbock — and keeping them there — has been tough for Tubby Smith. Lost in the talk of two of the top three NBA draft picks (Wiggins and Embiid) was the play of Ellis, who delivered on a breakout season. Ellis averaged 13.5 points and 6.7 rebounds last season and should be in position to pace the Jayhawks again. The 6-9, 285-pound Ridley enjoyed a breakout season as a sophomore, averaging 11.2 points and 8.2 rebounds. He’s been a force around the rim with 2.2 blocks per game. Morris finished last season with 134 assists to only 28 turnovers. Not bad for a freshman. Ellis has offensive versatility. Alexander will team with him in the Kansas frontcourt with a physical presence in the paint.